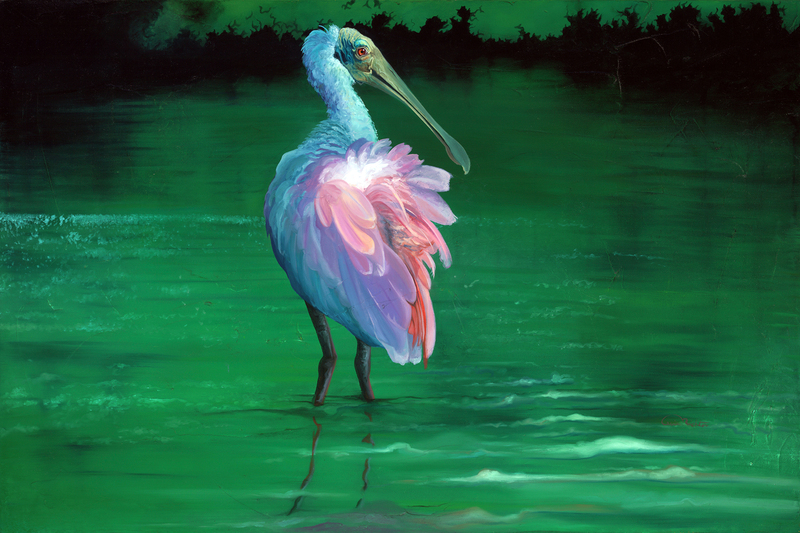 Spoonbill Original Artwork Oil on Canvas for sale "On the Flip-side" is a 24' h x 36' w of a Roseate Spoonbill standing in quiet waters. Quiet contemplation surrounds the theme of this original oil painting for sale. A pallet of pale cool color drape across this roseate spoonbill as it’s soft feathers blow with a quiet grace. The stillness created by the reflective waters and the peaceful bird brings the viewer into this scene to lose themselves in thought. It’s always those small moments we catch in time where we can sit and relax to reflect. As you bring this piece into your room you can almost feel the beauty and calm wash over your thoughts. Enjoy hues of pale pink, blue and green with a horizontal artwork h 24″ x w 36″ that compliments your chosen decor. “Flip-side” one-of-a-kind artist signed original has been sold. There’s only a few more spoonbill original artworks left! “Flip-side” brings an incomparable charm that can bring some of the elements of nature indoors. Whether adding a sense of escape to the office, enriching the home, or adding some extra flavor to that special vacation retreat, your new artist signed giclee can even more life to your interior space.